If you’ve arrived here via the Lion Brand Yarn Heros charity campaign, welcome! If not, click on the graphic below to meet all of the Yarn Heroes and learn about their awesome designs for charity! 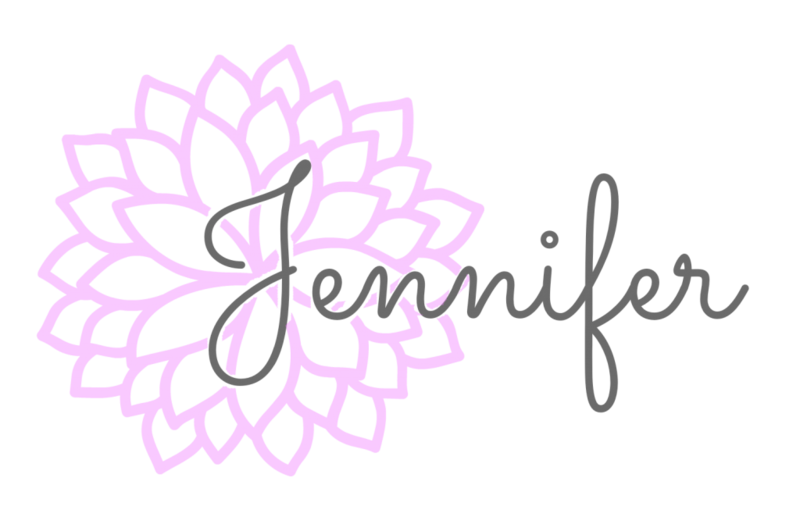 Without further ado…. 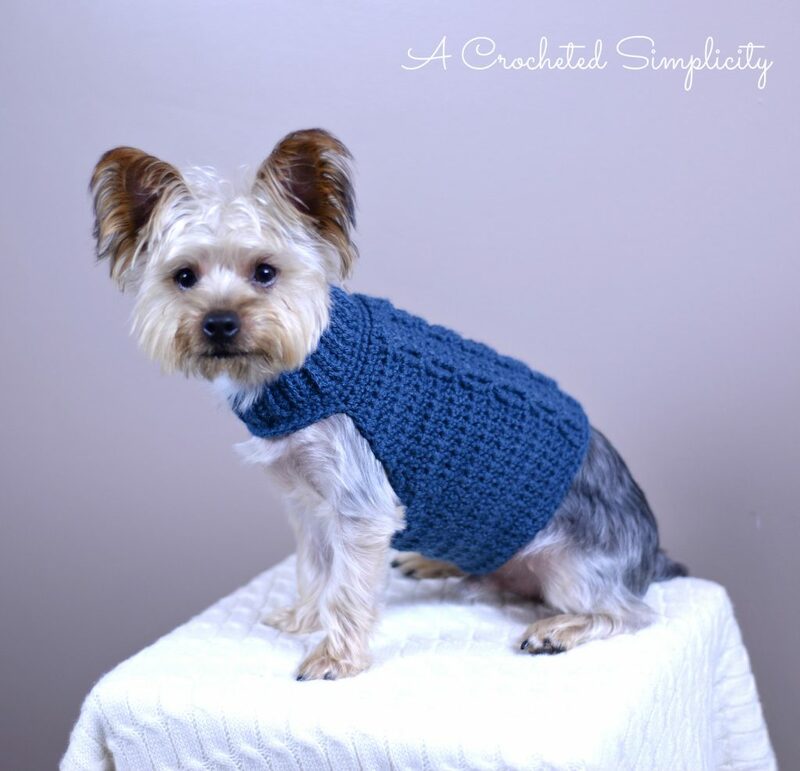 The Cabled Crusader (aka A Crocheted Simplicity) has designed a Cabled Dog Sweater (shown below) as part of the Lion Brand Yarn Heroes charity campaign. Find out more about this project —> HERE. Yarn: 100 – 200 yards / Light Worsted Weight 4 / (yarn shown in the samples is Lion Brand Yarn Wool-Ease Yarn, Denim). Extended Single Crochet (ext sc): Insert hook into stitch indicated, yo, pull up a loop, yo, pull thru 1 loop on hook, yo, pull thru remaining 2 loops on hook. Front Post Treble Crochet (fptr): Yo 2 twice, insert hook from front to back to front around the post of the designated stitch, yo, pull up a loop, (yo, pull thru 2 loops) 3 times. Forward Cable A (FWD Cbl A): Skip next 3 post sts, fptr around next 3 post sts, working in front of fptr just worked, fptr around each skipped post st. Click HERE for video tutorial. Row 3: Ch 1, BLO sc in each st across. Turn. Rows 4 – 37 (43, 49, 55): Rep Rows 2 – 3. Row 38 (44, 50, 56): With the RS facing out, bring the 1st row to meet the last row. Position your working yarn so that it’s on the inside of the neck. Ch 1, (Insert your hook from front to back into the FLO of the 1st st of Row 1, insert your hook from back to front into the BLO of the 1st st of the last row, yo, pull thru all loops to complete sl st) repeat across. Do not fasten off. Continue on to Neck Edging. Rnds 2 [(2 – 3) (2 – 3) (2 – 4)]: Ch 1, sc in each st around. Join. Do not fasten off. Continue on to Body of Sweater. Row 5: Ch 1, ext sc in next 6 (9, 12, 15) sts, fpdc around next post st, ext sc in next st, fpdc around next post st, ext sc in next 3 sts, fpdc around next 6 post sts, ext sc in next 3 sts, fpdc around next post st, ext sc in next st, fpdc around next post st, ext sc in last 6 (9, 12, 15) sts. Turn. Row 6: Ch 1, ext sc in next 6 (9, 12, 15) sts, bpdc around next post st, ext sc in next st, bpdc around next post st, ext sc in next 3 sts, bpdc around next 6 post sts, ext sc in next 3 sts, bpdc around next post st, ext sc in next st, bpdc around next post st, ext sc in last 6 (9, 12, 15) sts. Turn. Adjustments for Girth: If you need to adjust the sweater girth, you can do so at the end of Round 7 where you chain X. Simply add or subtract chains as needed to adjust the girth. Round 8: Ch 1, ext sc in each ch, ext sc in each st to next post st, bpdc around next post st, ext sc in next st, bpdc around next post st, ext sc in next 3 sts, bpdc around next 6 post sts, ext sc in next 3 sts, bpdc around next post st, ext sc in next st, bpdc around next post st, ext sc in each remaining st around. Join. Turn. Round 9: Ch 1, ext sc in each st to next post st, fpdc around next post st, ext sc in next st, fpdc around next post st, ext sc in next 3 sts, fpdc around next 6 post sts, ext sc in next 3 sts, fpdc around next post st, ext sc in next st, fpdc around next post st, ext sc in each remaining st around. Join. Turn. Round 10: Ch 1, ext sc in each st to next post st, bpdc around next post st, ext sc in next st, bpdc around next post st, ext sc in next 3 sts, bpdc around next 6 post sts, ext sc in next 3 sts, bpdc around next post st, ext sc in next st, bpdc around next post st, ext sc in each remaining st around. Join. Turn. Round 11: Ch 1, ext sc in each st to next post st, skip next 2 sts, fptr around next post st, ext sc in skipped ext sc, fptr around skipped post st, ext sc in next 3 sts, FWD Cbl A, ext sc in next 3 sts, skip next 2 sts, fptr around next post st, ext sc in skipped ext sc, fptr around skipped post st, ext sc in each remaining st around. Join. Turn. Round 12: Ch 1, ext sc in each st to next post st, bpdc around next post st, ext sc in next st, bpdc around next post st, ext sc in next 3 sts, bpdc around next 6 post sts, ext sc in next 3 sts, bpdc around next post st, ext sc in next st, bpdc around next post st, ext sc in each remaining st around. Join. Turn. Rounds 13 – ?? : Repeat Rounds 9 – 12 until sweater measures 8” (10”, 12”, 14”) & ending w/ an even number round repeat. Last Round: Ch 1, sc in each st around. Join. 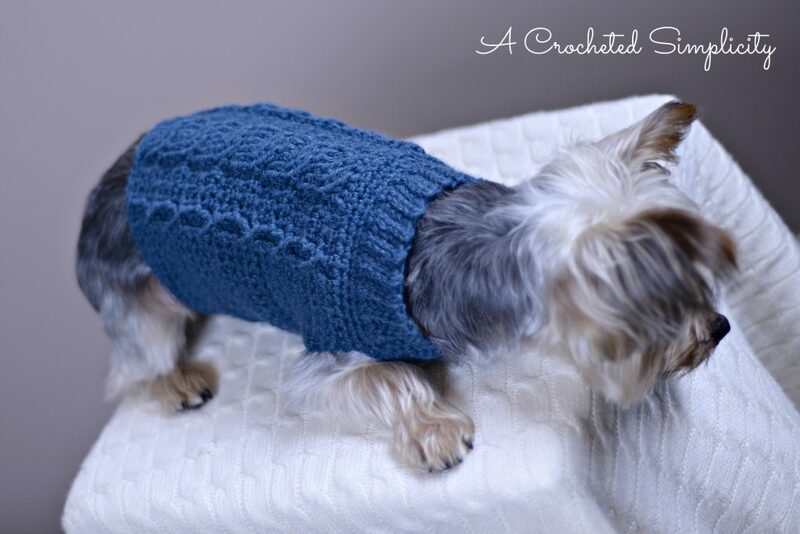 Check out some of my furry friends stylin’ in their Cabled Dog Sweaters! 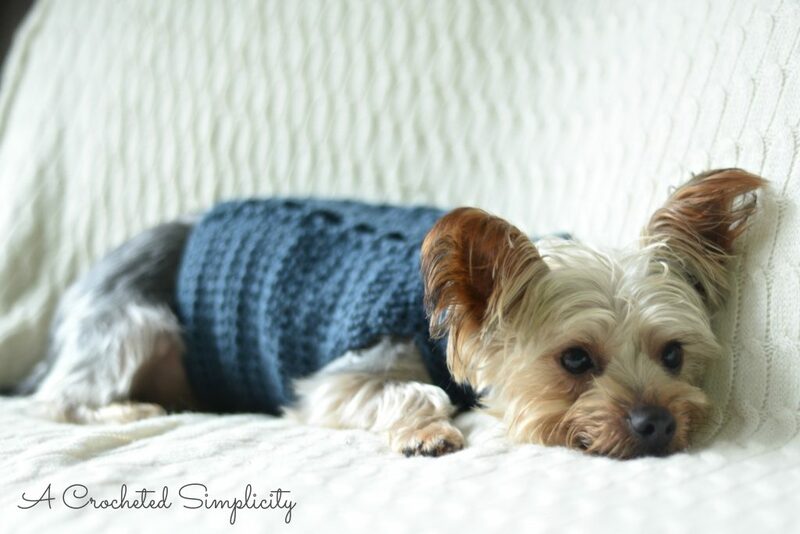 I hope you’ve enjoyed making your Cabled Dog Sweaters and that they’re enjoyed by lots of local dogs in need. <3 Please share a photo of your finished sweaters with me in my Facebook group: A Crocheted Simplicity Crochet Community Group. Take a video class with me! 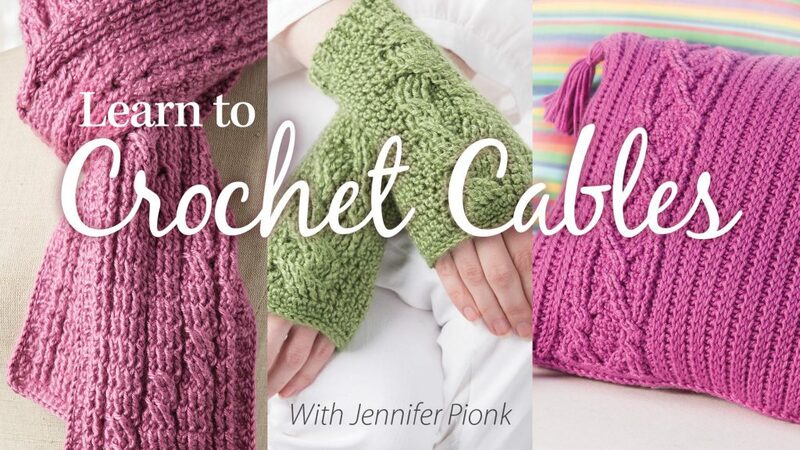 My Learn to Crochet Cables, Annies Video Class is now live. Click the photo below to find out more and watch a free preview! 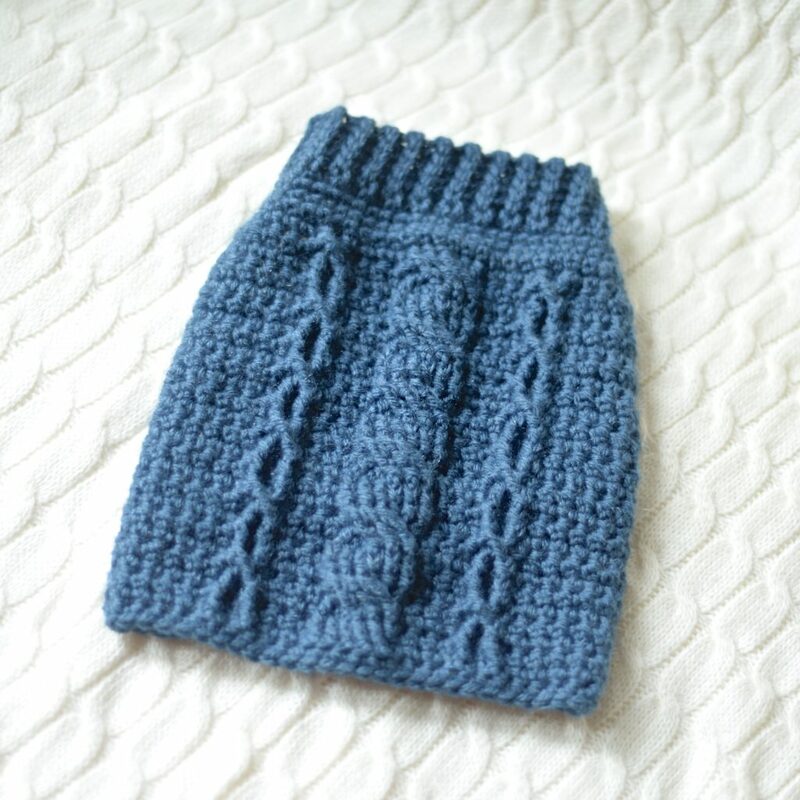 As always, you can see all of my designs in my Ravelry, Etsy, & Craftsy shops! Go forth and Do Good in the Yarniverse! « Unleash your inner Yarn Hero for charity! Just made this for my Himalayan kitty.. She is about to get groomed where she will be shaved down to practically no fur.. Need something to keep her nice and warm in the mean time. Thank you! Row 3 of the body totally lost me. I’m an advanced beginner, but I’m confused with skipping, the fptr in skipped ext sc. Please help. Hi Brenda~ This part is the small cables on each side of the larger cable. It is worked over 3 sts total. Think of them as sts 1, 2, 3…. Skip stitches 1 & 2, work a Fptr around st #3, then work a ext sc in st #2 (the one in the middle), then work a FPtr around st #1 (this makes the cross of the cable). A good rule to remember here is that all of your post sts will be worked around post sts. I hope this helps!